I wanted to return to this remarkable article1 - or "crazed" might be a better word - by Dominic Lawson partly because it is so remarkable and partly because it's as good a starting-point as any to discuss why it might matter that the nominee for ECF President says things like this. Because it does. And it also matters that his supporters are so unwilling to come to terms with this. Let me say that if you think it's all right to refer to young women as dressing like prostitutes - an incredibly unpleasant thing to say - then you've lost me already. I'm not addressing people who think you can refer to women like that. Not here. Maybe not anywhere. The people I'm addressing are those who understand that it's not all right - but don't see why it's relevant to Lawson's proposed role and to the ECF Board choosing him. But I think it is relevant - and manifestly so. To see what I mean, let's suppose for a moment that the ECF is a serious and properly-run organisation. Never mind, let's keep at it for a moment. Let's suppose for a brief period that the ECF is serious about inclusivity2 and that it doesn't want English chess to be quite so overwhelmingly composed of aging white men like the present writer, or at least, to put it a little better, that it wishes to provide an environment where players not matching that description are more comfortable than they have been hitherto. 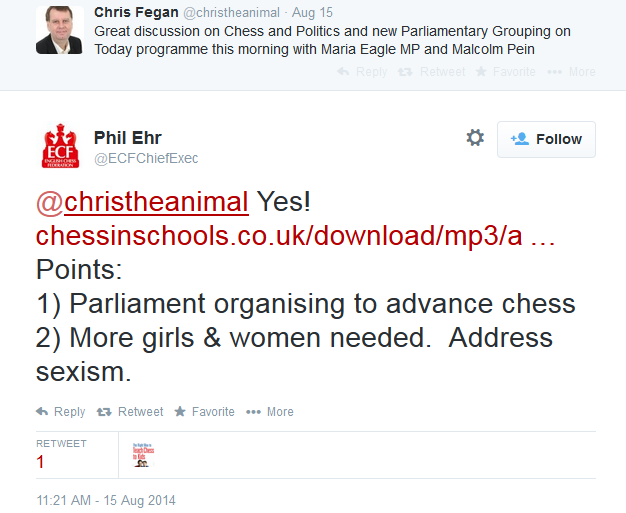 Let us further suppose that when its CEO expresses an aspiration to "address sexism", he actually means it. OK. If you are finding that a little too much trouble, let us put it another way. Let us put it more generally. More abstractly. Let us suppose that a serious organisation - in whatever sector - were looking to appoint a figure to a senior post which had fallen vacant. A senior post which entailed representing that organisation. Let us also suppose that they had a policy on, say, inclusivity. Not necessarily a priority, but something they did at least wish to take seriously. Would they, when trying to identify a suitable figure for the post, completely ignore any statements the candidate had made, recently or in the past, which posed any problems for that policy? Because in the first place, they'd be concerned about the image of the public face of the organisation and be aware of the possibility that the candidate's penchant for phrasing himself (or herself) incautiously and unpleasantly would reflect on the organisation. But also, because in the second place, they would be aware that their candidate would be meeting and representing real people. Some of these real people would be of Asian origin. Some of them would be gay. Some of them would be teenage girls. Some of them would have daughters who are teenage girls. This is the crux of it. We're not really discussing "views", in the abstract. We're discussing real people. Real people who may be discouraged, or offended, or outraged, or embarrassed, or disadvantaged by those "views" when they are expressed by their representative or put into practice. Real people who may have difficulty being around somebody, being represented by somebody, who describes their daughter as dressing like a prostitute or who describes their face as an inscrutable Asiatic countenance or who wants to be able to call them a poofter. Maybe these real people will end up having no problems at all. But the point is that the organisation would, of necessity, think about these things. During the recruitment process, they wouldn't be considered irrelevant.3 They wouldn't be something to which the organisation paid no attention. Because that's not how the job is properly done. They wouldn't just charge in and appoint, would they, somebody who was accustomed to writing in newspapers that teenage girls dressed like prostitutes, or that their intention was to appear "debauched"? Not if actual teenage girls were among the people they were hoping to encourage to join them? Not if they wished to "address sexism"? Of course they wouldn't. Not if they were a serious organisation. They wouldn't plump unhesitatingly for somebody with a penchant for language like "inscrutable Asiatic countenance" or "poofter", would they? Of course they wouldn't. Because they would have customers and clients and employees and partners to think about. So they would try to deal with this stuff in advance, wouldn't they? It doesn't mean they'd get it right. Nor does it mean they would, or would not, appoint a given candidate on those criteria alone. But a proper, serious organisation would think about it in advance. I just take that as read. So, since they're meeting today, let's ask the ECF Board if they are, indeed, proper and serious. Gentlemen. Here is a question to which I would appreciate a response. A proper and serious response. 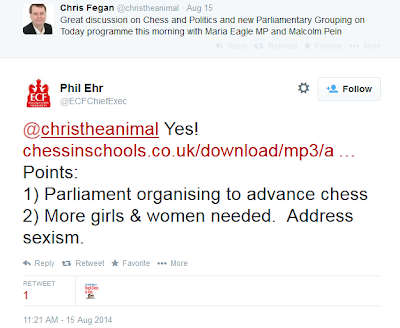 The email address of this blog is chesscomments@gmail.com. In considering Mr Lawson's suitability for the role for which you have nominated him, what questions have you asked him in relation to his more unfortunate public statements? Specifically, which statements of Mr Lawson's did you consider and what questions did you put to him? Or is the answer that no questions on that subject were put to Mr Lawson at all? Can't we have some chess? "Can’t we have some chess?" Afternoon, my anonymous friend. You may wish to remind yourself of the deal we - bloggers and valued readers - make. I mean, seriously, after seven+ years you think your question is likely to be answered in the affirmative? These questions are addressed to Phil Ehr in reality. It is not as though the whole of the Board has actually met DL in person. So either Phil risked putting off someone he wanted to run as President by asking him about some of these statements, or he didn't; but either way, I doubt that any other Board member has had a chance. (This business about DL being the nominated candidate of the Board is correct in that they did all agree to nominate him in favour of other candidates. But there obviously has not been the sort of full scrutiny by all Board members which Justin would have liked). In order for the board to nominate him, the board needed to vote on him. Therefore, at the very least a majority of the board (those who voted in favour) are accountable, and at most the entire board through collective responsibility. Either way, this goes further than just PE. a) I thought there were better things for the Board to be doing with its time (such as getting the minutes of meetings published). If the position remained vacant after the AGM *then* the Board could apply itself. b) I didn’t like the idea of the Board nominating for a senior position – it seemed somewhat anti-democratic. The expression “self-perpetuating oligarchy” comes to mind. On (a) I was told it had been stated at the last Council meeting that the Board would look to nominate. I did express concerns about Dominic Lawson: about his being outspoken on off-centre views, about his friendship with Ray Keene and about the fact he was Sunday Telegraph editor when it published the notorious obituary of Tony Miles. How cynical* can you be?